What has Martin Foster’s proudest achievement as a runner been so far? …And just who is Jude Glynn, really? 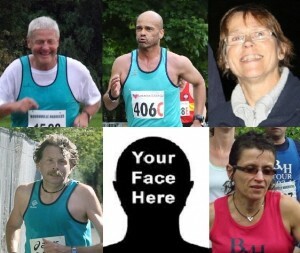 Nominations for your November 2013 Member of the Month can of course be sent to bvhchairperson@bournvilleharriers.org.uk. This entry was posted in Member of the month by BvH Admin. Bookmark the permalink. In fairness you should nominate someone you’ve never heard of… though I would like to win a LEAVE ME ALONE t-shirt… which I could wear with some irony… as I don’t really need one… ha very ha. I would like to nominate Ed please. I like the “YOUR FACE HERE” addition, can anybody win this?… perhaps a chance for someone who has not distinguished or disgraced themselves particularly… and basically, like to keep there head down, and just go for a run. I would happily supply the first winner, with an exclusive LEAVE ME ALONE t-shirt. So as you were, Mr/MsX, this one’s for you… or someone else. Chris, I have to take my friends where I can, imaginary or otherwise… though I don’t know what you mean, in this instance.